Armilla, designed by Lorenzo Truant, is inspired by the very first Renaissance depictions of the motions of stars and planets. At that time, it was customary for people to construct marvellous models called armillary spheres comprising a framework of rings. 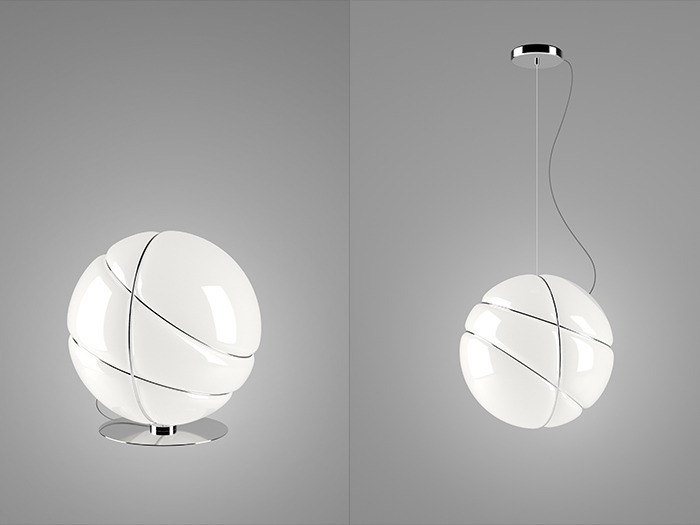 Lamps from the Armilla collection are available with a diameter of 36 cm, and come in the form of pendant and table lamps. The diffuser is made of glossy white glass blown on a round mould, with the metal rings inserted and carefully fixed in place using the melted glass at the end of the process. The rings have a polished finish, with gold and chrome plating. Designed to work with halogen, fluorescent and LED light bulbs (if connected to a mains electricity supply).